With the change of seasons comes a fresh start, and that can include your finances. If you feel like you need to get your money in order, a good way to do that is to either reduce your debt or increase your income. Making more money gives you more breathing room in your budget, but sometimes, a pay increase from a full-time job isn’t possible. 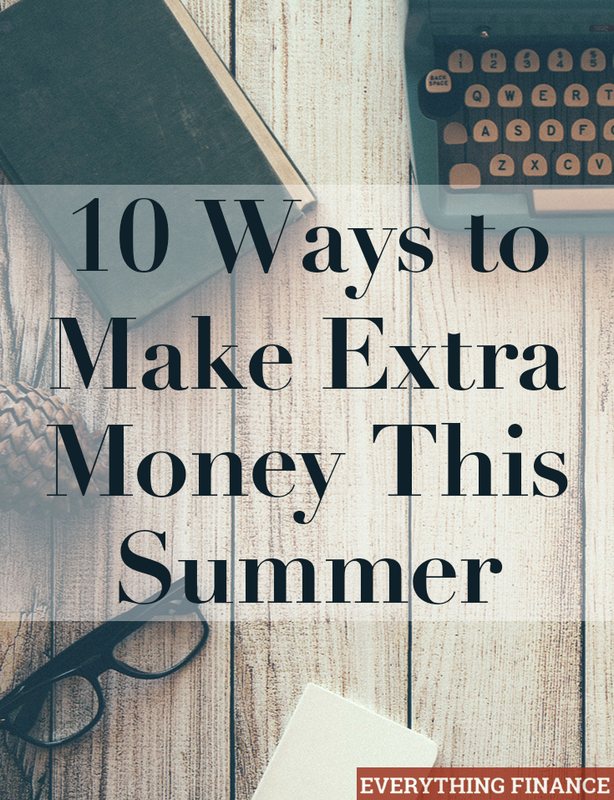 Finding extra ways to make money for summer allows you to get creative and pocket extra cash just by using your existing skills or items. Here are some ideas to get you started. Organizing your items for a yard sale or garage sale is a relatively straightforward process. Make sure you have a labelling process for posting prices of items and some signs for roads leading to your home. Also, post ads ahead of time online (like on Craigslist) or in classified ads to let the public know you’re selling your stuff. Don’t be afraid to barter with people who come, and have some cash on hand so you can give change for larger bills. You might also hire family or friends to stay for the day to help you keep track of what has sold and to negotiate on your behalf. After your yard sale or garage sale, donate the items that are left. Don’t bring them back in your home. You’ll reduce clutter and pad your wallet at the same time! Listing items online on sites like eBay and Amazon allow you to take stock of what you have and ship it to people who want it. This can be done with both large and small items. Before you get started, however, do some research about the prices of items you want to sell. Compare the quality of the listed items to the items you have to make sure you offer competitive prices. To prepare for selling items online, it’s a good idea to get packing supplies ahead of time to save money on shipping. Depending on the number of items you’re selling, you might want to buy tape, boxes, and Styrofoam peanuts in bulk, so you don’t have to purchase them every time an item is sold. Are you the kind of person who likes to make creative items, but hasn’t been able to sell them? Building an online store at a website like Etsy is a great way to make money from the items you’ve created while also minimizing what you have on hand, you could even make money before work with this option. If your shop is successful, you can continue to make money from your craft and grow your brand. Mowing lawns and taking care of other people’s yards is a good way to make extra money in the summer. Offer to help family and friends with yard work, or post flyers about your availability to help others in your neighborhood. You can offer general services or specific ones, such as trimming bushes or cutting tree limbs. Pricing for yard work services can be hourly or per service, or you can offer a package deal. Do some research on the range of prices others offer online before you begin to solicit for your services. The summer months are notoriously hot, and maintenance is a necessary evil of indulging in the luxury of having a pool. To alleviate the hassle for families that have pools, but want to forego maintenance, you could offer to clean their pool for them. Many pool owners may already have the supplies to maintain the pool, but be sure to ask ahead of time if you need to bring anything. You may be able to receive reimbursement for those costs. Pool cleaning can be offered on a weekly basis, and you may have an easier time pricing it per session or per hour, depending on your arrangement with the owner. School is out for the summer, but children still need care when parents are working. If you have the time to babysit or offer care for children, you can make money while giving parents peace of mind. Offer them a break for a date night or to attend other events such as weddings or graduations. If you have some type of credentials, such as CPR certification, make sure you advertise that as well. Many people offer childcare for hourly rates in the summer and discounts for multiple children. If you’re prepared to babysit in the summer, make sure to offer fun activities for the children so they can take advantage of the weather and the freedom summer has to offer. Families often want to travel during the summer, but may have concerns about their home while they are gone, such as how pets will do when they are away. Offer to check on homes and pets for families while they travel. As you gain experience, you can ask your past clients to act as references. Many home and pet sitters do small chores around the house, such as picking up the mail, watering plants, or going food shopping. You can offer to stay in the home while the family is away, but this isn’t required. Many families may only want you to check on the home a few days while they are gone, so be prepared to be flexible with each assignment. House and pet sitting can be offered on a daily or weekly basis, so charge accordingly. Do you have a valuable skill that you can pass onto others? Do you have an educational background that allows you to tutor people who want to keep their knowledge sharp before the school year starts again? Becoming a tutor or offering lessons can be a constructive use of your talent. Many tutors offer services in their own homes, but if that’s not possible for you, travel to your students’ homes, or go to the local library to provide lessons. Most lessons last for half an hour to an hour a day, but make sure you work out ahead of time what you plan to charge per lesson in order to receive fair pay. Tutors and instructors charge either an hourly rate or a per lesson rate. If you have good experience with tutoring or teaching, you can also offer it year round! Summer is a big season for the housing market. A lot of houses go up for sale, and staging a home to look presentable is a good way to make extra money. Real estate agents often work with stagers to highlight the best features of a house with decorations and furnishings that accentuate the space. If you have a knack for interior design (or an HGTV obsession), staging homes on the side may be right for you. Charging for staging homes can be done on an hourly or per-home basis, but make sure to do some research ahead of time in order to understand what pricing is fair. Summer isn’t just a good season to sell homes, but it’s also a good season to move. Families often wait until summer to relocate to avoid uprooting children during the school year, but packing and moving house can be stressful. Students also leave dorm rooms at the start of summer and may need help moving back home or into an apartment for the months between semesters and school years. Offering to help families and students move can be a lucrative service in the summer. If you have a strong back, are willing to work hard, and can handle the physical labor, helping families and students move may be a good way to make extra cash. Charging per hour to pack and move families and students is often a fair way to receive fair compensation for your time. Taking surveys online – Numerous websites offer surveys you can take about your habits and preferences. Depending on how detailed the questions are and how long it takes to complete surveys, you can earn a few dollars to over $50 per survey. Money Saving Mom has a list of six reputable survey companies you can try out in order to make money taking surveys online. Using apps for shopping – Many coupon apps can allow you to save on your everyday shopping. An article from Tom’s Guide provides a list of some of the most popular couponing apps shoppers can use. Testing websites – Marketing and development companies like the phoenix seo agency want to receive real-world perspective on the sites they create. The Dream Home Based Work website offers a list of 11 companies which offer money in exchange for users to test websites for developers. Summer is a good season to take control of your finances and earn extra cash doing everyday things or learning new skills you can offer for cash. Try your hand at making money on the side to improve your budget or plan for extra savings you can use throughout the year.